Don’t know what to wear for tea? Inspired by the beauty of porcelain potteries, embroidered and laser cut table cloths with flower patterns, 24-years-old designer Le Thuy provides us with the perfect outfits for an traditional English afternoon tea with a touch of Orient. And if you break your cup, just stick it on your dress – no one will notice. 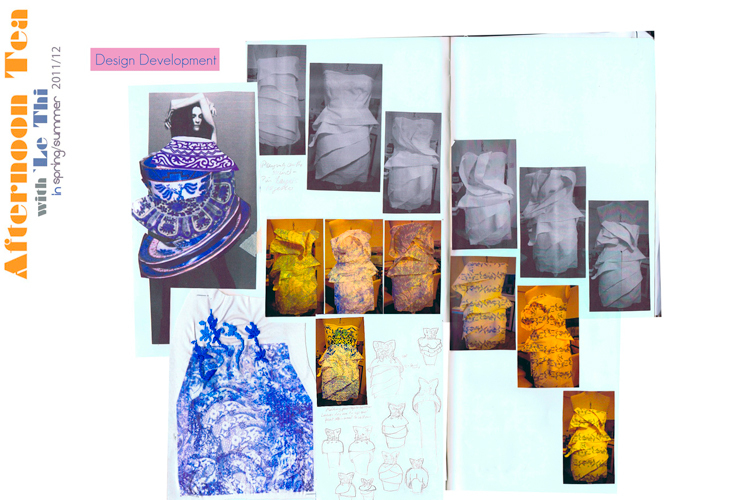 Looking at old images of people having tea, the University of East London graduate created a feminine, elegant collection with a mix of playful elements. Le Thuy, what’s your origin? Vietnamese, but I grew up in Wittenberg, Germany. 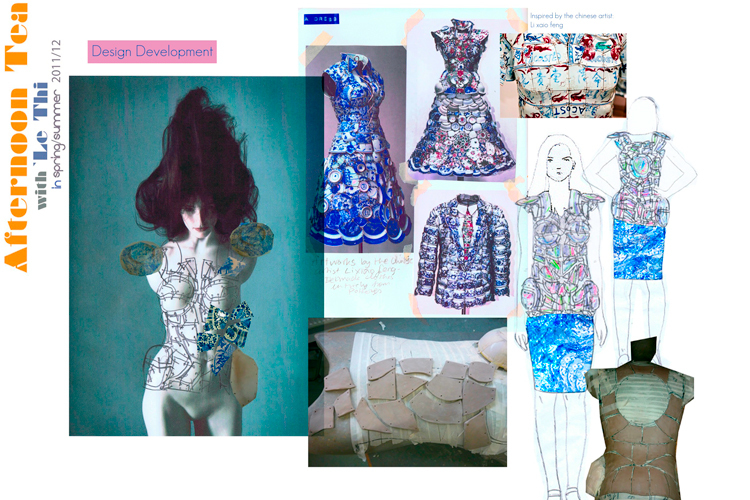 My design signature is femininity and playfulness, with a mix of tailoring. And I love colours and texture. The graduate created a feminine, elegant collection with a mix of playful elements. Le Thuy's collection consists mainly of delicate embroidery and laser cut. What materials did you use in your collection? I used chiffon, leather, cotton silk, wool, and real pottery. My wearer should feel confident, elegant and youthful. 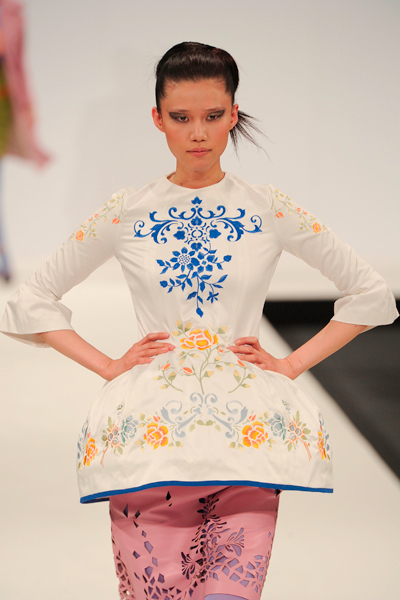 The embroidered flowery designs are inspired by Chinese blue and white as well as by English potteries. The colour palette are muted pastel colours giving the collection a soft look. 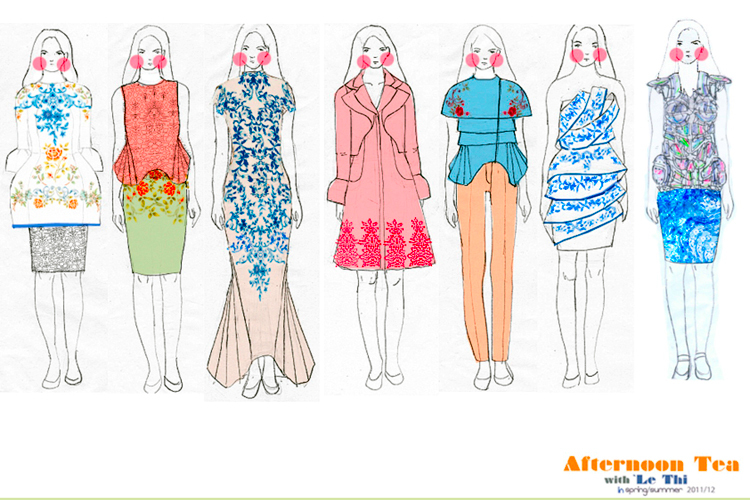 I love the long embroidered dress with the peach coloured laser cut top, simply because of the amount of intensive work. If the collection was country – what land would that be? I think it would be the UK because of its diversity. Today I had toast with Geflügelwurst (German sausage) and chilli sauce. Le Thuy's favourite look from his collection. I like to listen to all kinds of music that keeps me calm while developing my collection because I can get moody very quickly. I love Coldplay, The Kooks and Muse. Besides working on a new collection I partake in a placement to gain more experience. So in five years time, I would like to have my own label. 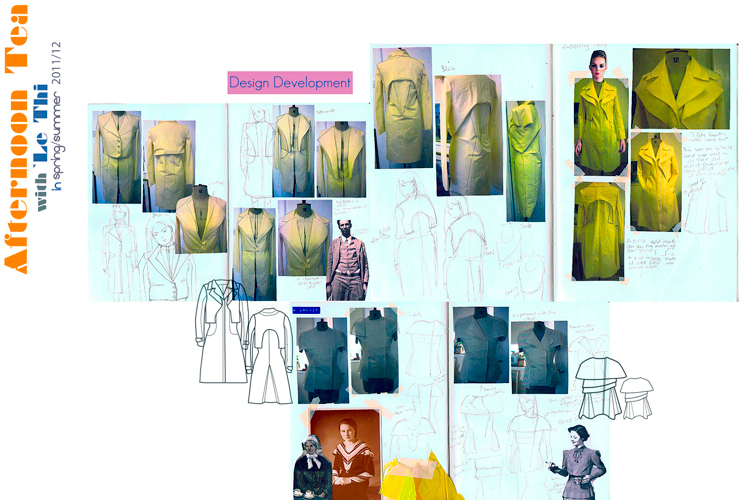 If this is not going to happen, I would like to run a small fashion school to motivate young people to do fashion. 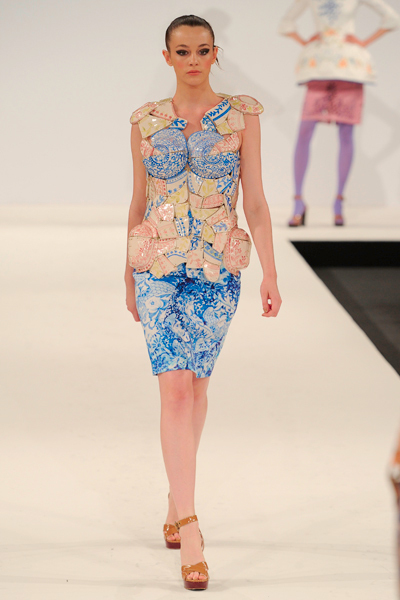 Le Thuy showed his collection at London’s Graduate Fashion Week.